Whether it is through injury or age, losing the ability to be active can often feel like a huge blow. It could impair one's ability to have a social life, for instance, and make performing simple household tasks much more difficult. However, it doesn't have to be a problem. There are a great many mobility and walking aids, including walking frames and zimmer frames, available to assist you in getting around. Millercare is proud to present a range of these such products for people who are in that particular situation, or simply know a friend or family member who is. Our catalogue of walking sticks and Rollators can help to get you back on your feet with just a little assistance. Our store has a variety of items including standard, foldable and Zimmer frames with wheels to help ensure faster mobility. These simple yet very effective designs provide a frame for people suffering from mobility problems to hold in front of them when walking. They act as a crutch to take the majority of the weight and thereby improve your balance. On average, they are 12 inches high to allow users of all sizes to comfortably hold them, but most of Millercare's range is also adjustable so you can set it to however you like. The name 'Zimmer frame' derives from Zimmer Holdings, an American business headquartered in Indiana where these types of frames were traditionally manufactured. 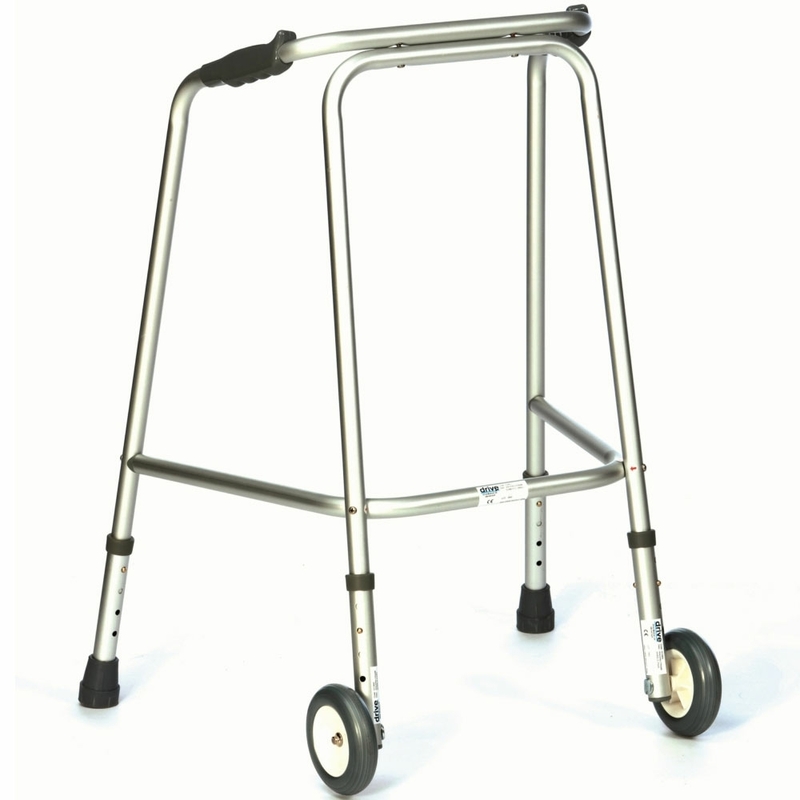 Millercare also has a range of four wheeled walking frames known as Rollators. These combine mobility assistance with comfort and storage to provide a useful walking frame with wheels you can take everywhere. They not only come with a study frame - not unlike a Zimmer frame - that you can hold onto to support your weight. Many of our products also have a cosy seat and backrest for when you may wish to stop and rest your legs, as well as a large basket and pocket to hold the items you wish to take with you (shopping, money, mobile phone, etc.). Furthermore, it has a lock feature on the wheels for added security when you are out and about. A similar but smaller, cost-effective and more economical alternative to zimmer frames is the three wheeled walking frame. These walking aids are built in a range of styles and colours including graphite, chrome, steel and much more. The tri-wheeled walkers allow you to combat your mobility problems by proving a secure, adjustable frame to carry your weight. They are stylish, easily transportable and have a good storage space for safely carrying your essentials with you while you are on the go. All of our products can be purchased online with standard or next day delivery. Orders over £30 with standard delivery are free of charge no matter what the quantity of the order is.